Asteroid Precision in Illinois is committed to providing the Midwest region with the absolute highest standards in OEM component production with our industry-leading centerless grinding and other precision grinding services. We know that your business depends on your products meeting detailed specifications. That’s why we work tirelessly to perform up to our own exacting standards and produce work that you can trust will meet your needs each and every time. Asteroid Precision has over 50 years in the industry that has allowed us to gain extensive knowledge and understanding of the variety of industries that we serve. Our experienced and highly trained Machine Operators have been our foundation since our doors opened in 1966. Our continued success in delivering quality, consistent results can be attributed to the ongoing training programs we provide to our employees. Constant communication between Machine Operators and our Process Control Department allows opportunities for idea building and improved processes, so we never stop getting better. At Asteroid Precision, we believe that our customers deserve the best, so we continue to strive toward perfection every day. When it comes to well-executed precision grinding, Asteroid Precision has earned a reputation for unmatched quality. Whether you need centerless grinding or cylindrical grinding, precise tolerances are regulated with quality control procedures and state-of-the-art instruments. Our geometry gauging system indicates roundness and concentricity of OD and ID down to ± .00001˝. Laser micrometers deliver repeatability and accuracy to ± .00002˝ and an accuracy of ±.00001” with single point mastering. Our diligent quality control process along with our Mitutoyo CS-3200 and Mahr MMQ 400, provide complete SPC capabilities. Quality control is maximized with our multi-level inspection process, which can be documented and shared with you upon request. 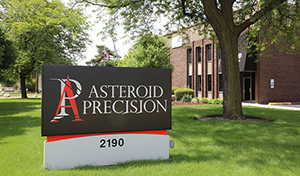 If you need precision grinding services of the highest quality, contact us today and see why Asteroid Precision is Illinois’ leading producer of OEM precision components.